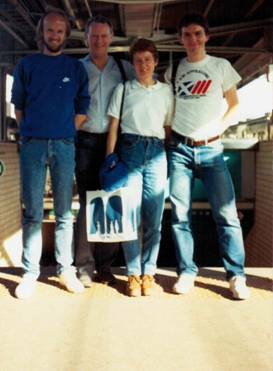 The team in Seoul in 1987: Fraser Clyne, John Brown, Sandra Branney and Lindsay Robertson. 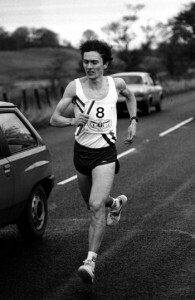 Lindsay Robertson is ranked number seven on the Scottish all-time marathon ranking lists with a time of 2:13:30 run in Frankfurt on 25th October 1987. Only two Scotsmen have run the distance faster since then. In addition he has run seventeen sub 2:20 marathon races. He was a member of Edinburgh Athletic Club which was one of Scotland’s strongest road and cross country running clubs of the seventies and eighties. Among their top men were Jim and Alex Wight, Jim Dingwall in his pre Falkirk Victoria days, Jim Alder, Doug Gunstone, Sandy Keith and several others. So when Colin reports below that Lindsay was EAC’s top road runner at the time, it is a considerable compliment. He had a quite remarkable record and maybe more should be known about him. With this in mind, Colin Youngson has written the following account of Lindsay’s athletic career. Lindsay Robertson was born on 28th June 1958. In time he developed into one of Scotland’s very best marathon runners. At first he represented Edinburgh Athletic Club in the usual cross country and road races including the Edinburgh to Glasgow Relay where his debut run in 1979 made an immediate impact – he was fastest on Stage Seven and EAC finished second. Soon he was given the responsibility of running Stage Six and speeded up rapidly to hold his own in distinguished company. In fact he raced the longest leg seven times and his club won two more silver medals, in 1982 and 1987. Undoubtedly EAC rated Lindsay Robertson as their best road runner during this period. Over the country he seemed less assured but still counted in EAC National Cross Country Championship teams which won gold in 1981 and silver in 1983. When the time was right Lindsay concentrated on what would be his strongest event – the marathon. Races such as the Edinburgh to North Berwick had been part of the programme for him – the race was/is a Scottish classic that had been started back in the late 1950’s and it had attracted a fine mix of top Scottish endurance runners (eg marathon champions Harry Fenion, Hugo Fox, Don McGregor) as well as some very good athletes from the North of England (Jim Alder, Terry Rooke) The distance had originally been 22.6 miles but had changed by the time Lindsay took it on in 1982 to 21.8 miles. No matter he won in a new record time of 1:50:55 which was over a minute and a half quicker than the next fastest over that course. He repeated the feat the following year but the record stood. 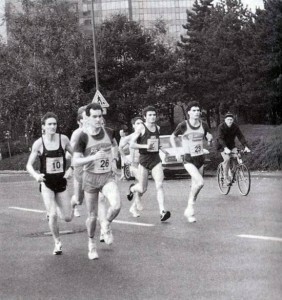 So by the time he started on the 26.2 miles he already knew a thing or two about long distance road racing. He was a very determined, hard yet intelligent trainer. In addition he was quiet, modest and a true Christian with a healthy lifestyle who never ran a poor marathon. 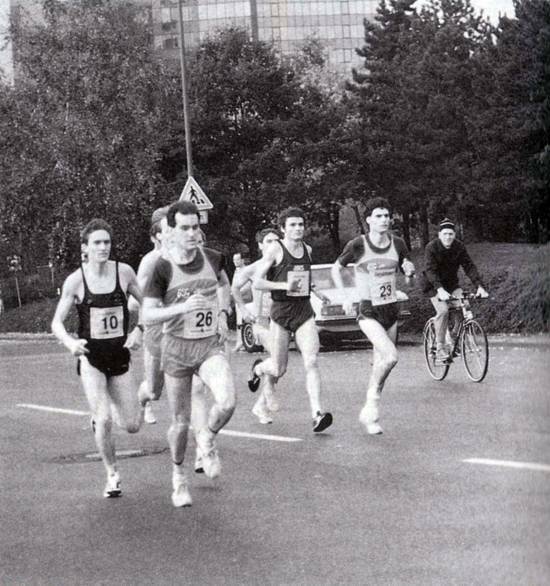 His first Marathon was in Gateshead in 1982 and it was a sub 2:20 – 2:19:18 for fourteenth place to be exact. He followed this with 2:21:43 for third in Edinburgh then in October it was off to Turin where he ran 2:19:16 to be fourth. This was his first GB vest although not quite the ‘full GB’ international kit – it had diagonal stripes but he made up for it with full colours for the European and Worlds in 1985 and 1987. He remembers that he pulled or tore a muscle at about 10 miles and although feeling that he was running with a straight leg for several miles managed a sprint (he suggests that it was more just running slightly faster!) at the end of the 2:16 time. The aftermath was that he couldn’t walk properly for some time afterwards. Fourth place in his first British international in a fast time was some consolation though. In 1983 there were three very good marathons in Barcelona, London and Edinburgh where he won in 2:21:36. (2:16:06). 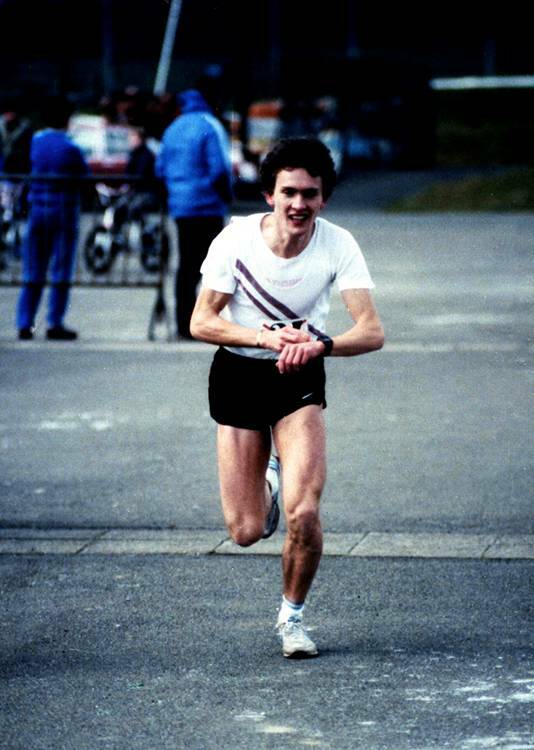 He had received a personal invitation in 1984 and after running so well, was invited back for the others – unfortunately he could not run in 1986 because of injury so when he won in ’87 it was ‘run three, won three! 1985 also produced thirteenth in the London Marathon in another personal best of 2:14:59. A year later he completed the same race in the same position only four seconds slower. Now that is consistency! Sadly, just when he was extremely fit and ready for an even more impressive run in the 1986 Commonwealth Games in Edinburgh, two days before the race he went down with an illness (probably food poisoning). However he reached his peak in 1987. In April that year he represented Great Britain in the World Marathon Cup in Seoul, finishing a fine twenty second in 2:15:07. On the trip he was part of a Great Britain team – four men, for women – who travelled to Korea to race over the course to be used the following year for the Olympic Games. Fraser Clyne and Lindsay were in the men’s team and Sandra Branney was the sole Scot in the women’s team. John Brown the SAAA Treasurer travelled as well as part of a fact finding mission. They did not travel directly to Korea but lived for four days at the Nihon Aerobics Centre just outside Tokyo which was to be the holding camp for the GB Olympic team. Described by Fraser Clyne as ‘impressive’, the word seems rather mild when you consider that it had (a) an outdoor synthetic six lane track, (b) a three lane indoor track, (c) the centre is fully equipped with every sort of exercise, medical and physiotherapeutic equipment, (d) a 25 metre swimming pool and jacuzzis, saunas, roller beds and a hydrotherapy unit. The team were quartered in log cabins set on the wooded hillside. Sounds ideal but apparently there was little in the way of off road training for the distance runners. After the four days there, they transferred to the Sheraton Walker Hotel in Seoul. Sandra ran well to finish twenty sixth and be a counter in the women’s team which was fifth. In the men’s race, the race was won by Ahmed Saleh in 2:10:55 from Taisuke Kodama in 2:11:23. The team finished eight with Dave Long first home in 20th place (2:15:04) just ahead of Lindsay who was only eight seconds outside his personal best. He had been 79 seconds behind Long at 35 kilometres but finished very strongly and in fact his final 2 kilometres is reported to have been faster than Saleh’s. Fraser Clyne was forty seventh. Then on 25th October he won the Frankfurt Marathon in a superb 2:13:30 which makes him sixth fastest Scotsman ever for the distance. An amusing anecdote about this race is that the owner of a bar had put up a prize for first man at 10K. Lindsay did not know this but was determined to stick with the leaders no matter what. So he followed a runner who turned out to have the sole aim of winning this prize. Running flat out, Lindsay looked over his shoulder to see the European bronze medallist and the rest of the pack miles behind! However his impressive stamina allowed him to hang on for an excellent victory. In all he ran no fewer than seventeen sub-2:20 marathons (not far behind Don Macgregor’s 25) during a short but extremely impressive career. These are included in the table below.